KS Automotive is a state-of-the-art manufacturing company that specializes in engineering, molding, and assembly. KSA is strategically located to provide Just-In-Time support to the Northern California Automotive Industry and has an established track record of fulfilling the most demanding needs of the dynamic automotive industry. KS Automotive understands that efficiency and the elimination of waste means a more competitive product in the marketplace. In that light, KSA operates according to the philosophy of the Toyota Production System and its many features. Efficiency and waste elimination are themes throughout every department at KSA. A majority of the problems that a part/process encounters can be eliminated in the engineering and design phase of a project. The Engineering Team at KSA along with a Program Manager and other key members form a Supplier Development Team (SDT) when a program is awarded. The SDT works along side its customer in order to eliminate potential problems and issues. Supplier Development Teams solve problems and establish a process, which makes for an easy start of production. A feature of KSA’s operation is automation. 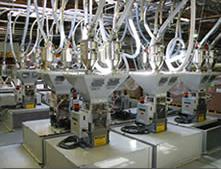 Automation brings repeatability and consistency, which increases efficiency and reduces labor costs. KSA’s Process Engineers are constantly working to improve a process and increase efficiency. KS Automotive is part of the KS Manufacturing Group. © 2018 Kennerley-Spratling, Inc. All rights reserved.